On September 21st 2017, exactly a year ago, India were up 1-0 in a five match series against the mighty Australian side after defeating them in the first one-day international at Chepauk. The players were ready to play the second ODI at the historic Eden Gardens, Kolkata. Skipper Virat Kohli elected to bat after winning the toss, and for the first time in that season he scored big against Australia. He played a well-tailored innings of 92 on a humid afternoon in Kolkata. His partnerships of 102 with Ajinkya Rahane for the second wicket and 55 with Kedar Jadhav for the 4th wicket were vital as India scored a defendable 252. Thanks to a batting collapse in the last 15 overs, India could not score 300 or more. The Eden Gardens wicket was two-paced and after rains, it became just more difficult to bat on. Nathan Coulter-Nile and Kane Richardson picked up 3 wickets each while Ashton Agar and Pat Cummins chipped in with one wicket. During the innings break, the Men in Blue may have thought they could defend 252 on an Eden Gardens track that had been difficult to play strokes on. They may have called for even better help for their bowlers under lights - it was the chief reason Virat Kohli had elected to bat first. The Kangaroos got off to a shaky start as they lost openers Hilton Cartwright and David Warner before the team total went into double digits. Bhuvneshwar Kumar picked up both the wickets as India started off with a bang. Steven Smith and Travis Head tried to stabilise the innings as they stitched a 76 run partnership for the 3rd wicket. After adding 20 more runs, Australia lost two more wickets in the form of Head and Glenn Maxwell as Steven Smith scored his 18th ODI fifty. 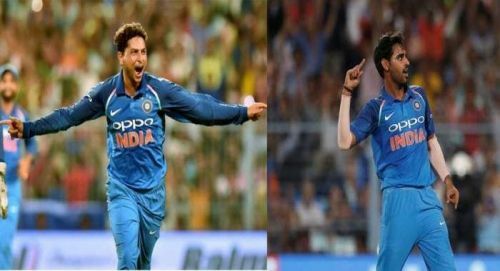 After the fall of Smith’s wicket in the 30th over, skipper Virat Kohli re-introduced Kuldeep Yadav into the attack, after being taken out due to Maxwell’s outburst. The left-arm Chinaman spinner dismissed Matthew Wade, Ashton Agar, and Pat Cummins in the 33rd over of the match to vanish Australia’s ultimate chances of creating something of their quest. He spun three unique deliveries for the three scalps while becoming only the third Indian to pick up a hat-trick in a 50 overs game. The googly which he bowled to dismiss Cummins was the toughest ball to play for any tailender. 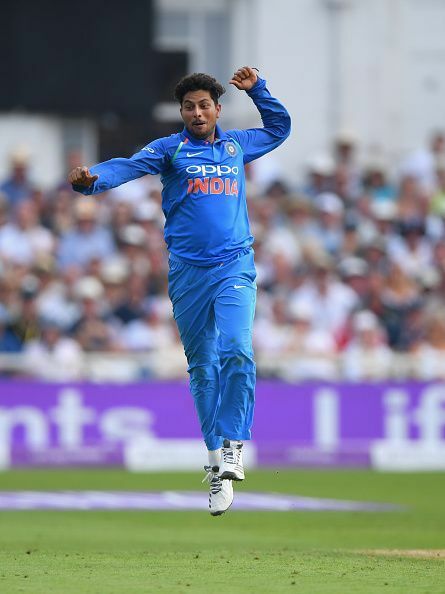 Bhuvneshwar Kumar and Hardik Pandya wrapped up the tail despite a valiant effort by all-rounder Marcus Stoinis (62*) as India beat Australia by 50 runs in the end in Kolkata to take a decisive 2-0 lead in the series.